Sweet and healthy in the same bowl? Feel satisfied in a hurry with a mix of flavorful fruits, crunchy granola, 11+ grams of protein, and some creamy, fruity goodness to blend it all together. Take with you anywhere--just add cold water, stir, and eat! 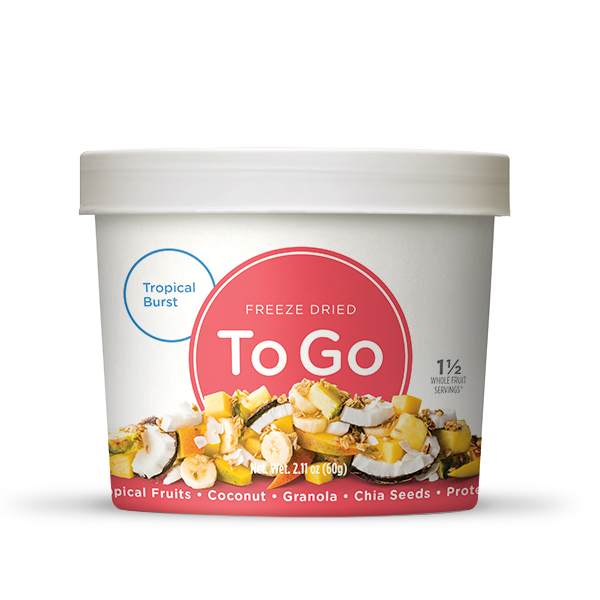 The Tropical Burst To Go Bowl contains tropical fruits, coconut, granola, chia seeds and egg white protein. Granola (Whole Rolled Oats, Dried Cane Syrup, High Oleic Sunflower Oil, Molasses, Whole Oat Flour, Rice Flour, Honey, Maltodextrin, Salt, Natural Flavor, Mixed Tocopherols, Soy Lecithin), Egg Whites, Mango, Pineapple, Bananas, Organic Coconut, Chia Seeds, Silicon Dioxide (anti-caking agent), Carrot and Beet for color, Maltodextrin (Anti-Caking Agent).